Nourison draws from over 35 years of craftsmanship knowledge to deliver bold, stylish area rugs and decor for your home.Click here to shop more. Dimensions 156.0 In. X 120.0 In. X 0.25 In. Perfect low maintenance rug! The colors are not too vibrant but that's what I was hoping for when I ordered. Looking forward to purchasing some accessories to match this color scheme. Very satisfied customer! 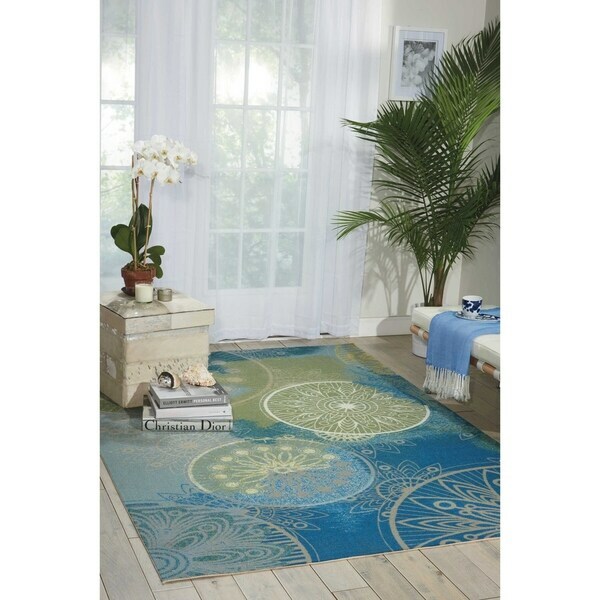 Great price, beautiful rug! Get compliments on it all the time. It’s under our dining room table. Sprayed it with a protector in case food falls on it. Gotten a few stains on it here and there, but able to clean them out for the most part. Brightens our room and has a unique pattern! Nice carpet but the colors are more muted when compared with photo. "What is the backing made of?" We need a 10 X 13 or 14' outdoor rug to coordinate with another rug we have.